3) Mix the soaked sabudana, peanuts, coconut, sugar and salt. 3) Heat a wok, non-stick prefrebly, add ghee, then add cumin seeds and green chillies to it. Let it splutter. 4) Add the sabudana mixture and keep stirring the mixture till the sabudana gets cooked i.e turns transparent. 5) Serve with Batatyacha kees, Dahi, Banana chips and lemon pieces. 1) Heat oil in a thick bottomed vessel. Add cloves, black pepper and let them crackle. Add sliced onion and fry till golden brown. 2) Add green peas, potatoes, carrots and stir fry till potatoes change colour. Then add tomatoes and sauté till they turn soft. Cover the vessel till the veggies are 75% cooked. 3) Add rice to this and mix well. Add warm water and salt to this. Cover the vessel again and let it cook. It takes about 7-10 mins for the pulao to be ready. 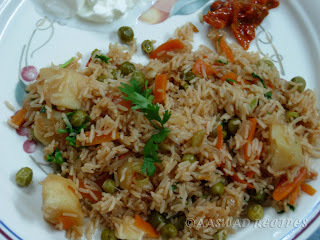 4) Alternatively the pulao can be pressure cooked in a cooker for 4 whistles (vary depending on your cooker). The only difference would be to semi cook the vegetables by just covering the cooker and not locking it. 5)Garnish with coriander and lemon pieces. 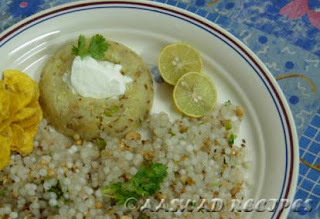 6) Serve hot with Boondi Raita, Salad, Boiled egg or Papad.